Kuhl (5-4) gave up two runs, one earned, and six hits while striking out six and walking three. It was his first win since May 6 at Milwaukee, a span of seven starts, though Kuhl allowed no more than three runs in any of his previous four outings. The Pirates pulled ahead 3-2 in the sixth on consecutive sacrifice flies by Starling Marte and Colin Moran off reliever Michael Lorenzen. The runs were charged to Harvey (1-5), who was lifted after giving up back-to-back singles to pinch-hitter Elias Diaz and Josh Harrison to start the inning. Harvey allowed three runs on four hits with two strikeouts and two walks. The former New York Mets ace is 1-3 with a 5.09 ERA in seven starts since being traded to Cincinnati on May 8 after being designated for assignment. Wandy Peralta relieved Harvey and hit Corey Dickerson, the only batter he faced, with a pitch. That left the bases loaded with none out for Lorenzen. Felipe Vazquez held on in the ninth for his 13th save in 17 opportunities. Tucker Barnhart singled with two outs and pinch-runner Billy Hamilton stole second base before Joey Votto struck out swinging. Tyler Glasnow and Kyle Crick also pitched one scoreless inning of relief. 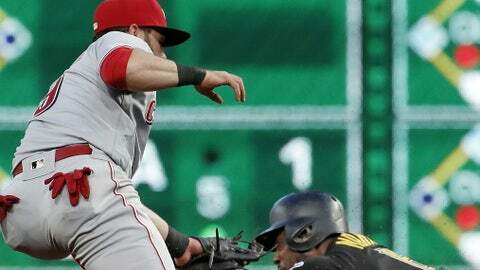 A sacrifice fly by Scooter Gennett in the third inning drew the Reds into a 1-1 tie and they went ahead in the fourth, scoring a run on a throwing error by Kuhl. Pittsburgh scored the game’s first run when Gregory Polanco grounded into a double play in the second inning. The Reds lost despite outhitting the Pirates 7-5. They were 0 for 11 with runners in scoring position and stranded 10 baserunners. Cincinnati’s Jose Peraza had two hits. The move is procedural, so Kang can begin drawing the prorated portion of his $3 million salary. He has already played in 11 minor league games. He was cleared to travel to the U.S. on April 27. The Pirates signed South Alabama outfielder Travis Swaggerty, the 10th overall pick in last week’s amateur draft, to a contract with a $4.4 million bonus and assigned him to short season Class A West Virginia. He hit .296 with 13 home runs and a .455 on-base percentage in 57 games this year. Reds: RHP Homer Bailey (right knee inflammation) stopped his rehab assignment at Triple-A Louisville. On the disabled list since May 30, Bailey made one start for Louisville and was tagged for five runs in three innings Monday. Pirates: RHP Richard Rodriguez (right shoulder inflammation) is scheduled to pitch a simulated game Saturday. Reds: Luis Castillo (4-7, 5.79 ERA) has lost his last three starts with a 7.47 ERA. Pirates: RHP Ivan Nova (3-5, 4.68) beat the Cubs at Chicago last Sunday in his return from the DL, allowing one run in 5 2/3 innings after being out with a sprained right ring finger. He is 3-7 lifetime against Cincinnati.